That's not to say you won't ever need one. If you want a saw to help you spruce trees and clean up after storms, get an electric chainsaw. Today, electric chainsaws are nearly as powerful as gas chainsaws, so you won't have to sacrifice cutting quality when you use one. Plus, unlike gas saws, they only run while cutting, making electric chainsaws a very safe choice for operators. Although not as powerful as gas chain saws, corded electric models can cut bigger and harder logs than their cordless counterparts. They're ideal for slicing branches and small trees close to the ground. Powered by extension cords, you'll need to be within 100 feet of a power source to operate one. If you don't want to feel like you're on a restricted island, cut the cord and try a cordless chainsaw instead. They are perfect for small jobs such as cutting branches and trimming limbs. 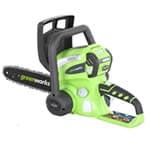 Cordless chainsaws are powered by rechargeable batteries that typically give you about an hour or two of cutting time. So, if you want to spend a full day sawing, make sure you come prepared with multiple batteries. Electric Chainsaw Buyer's Guide.. Our Power Equipment Direct how-to library can help you learn about Tips for Starting Your Gas or Electric Chainsaw, Benefits of Corded and Cordless Chainsaws and Proposition 65 Product Labeling.